Quadrant Scale for GSM Balance is a simple and quick device which directly indicates the weight per unit area in grams per square meter (GSM) on a sector scale when a sample of selected size is suspended from a clamp fixed to the pointer arm. 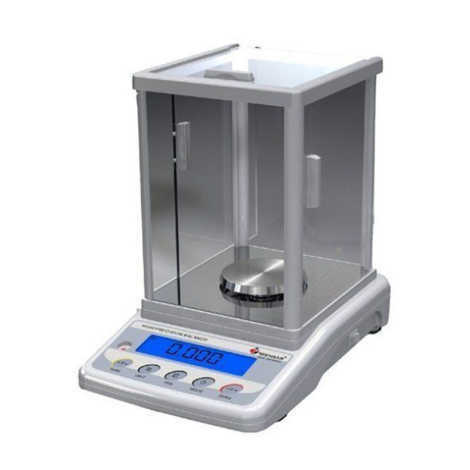 GSM Balance measures the GSM of fabric, paper, flooring, PVC film and other flexible sheet material. The system is supplied with two templates. The ASIAN GSM Balance is designed to give the weight per unit area of textile fabrics directly. It consists of a quadrant scale calibrated in values of GSM fixed in a vertical plane on a rigid base having provision for leveling. A pointer beam is pivoted on two jewel bearings at the center point of the scale. A specimen of specified area is cut out from the fabric with the help of either of the two templates provided (or by round cutter) and is suspended on one end of the pointer beam. The weight per unit area is read directly from the quadrant scale.